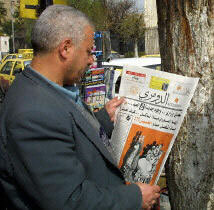 A Damascus man reads Al-Domari, the first satirical weekly to be published in Syria in 38 years (Photo: Louai Beshara/AFP). When Bashar al-Assad was swept to power at the age of 34, weeks after his father Hafez’s death in June 2000, he was best known as a Western-educated enthusiastic proponent of the Internet. Soon after Bashar took office, foreign journalists reported that satellite dishes were sprouting on Damascus rooftops and that an Internet café had appeared on a street at least 2,000 years old. After 6,000 years, a government-owned Egyptian newspaper reported, ancient Damascus was shedding its oasis mentality. The “Damascus Spring” was in full bloom. Broad reforms, it was hoped, would throw the shutters of the ancient city open, bringing fresh air to Syrian economic, political, and cultural life. New newspapers appeared, more foreign publications became available, trendy Lebanese music stations filled the FM radio waves, and foreign and local advertisers fought for newly freed-up billboard space on the nation’s highways. Two years on, analysts worry the “Damascus Spring” may be followed by a cold snap. The rate of the the Syrian media’s opening has certainly slowed. Baath Party officials have obstructed the evolution of a freer press, while the worsening Arab-Israeli conflict has meant the strict parameters within which the media operate have stayed firmly in place, since the security apparatus is able to argue that the Israelis could abuse a less tightly controlled media by planting stories in the Syrian press. Syria’s three main dailies—Tishreen, Al-Baath, and Al-Thawra—are all state-owned. In theory, all three have their own character and raison d’être. Al-Thawra, meaning “the revolution,” is the state’s premier mouthpiece, set up after the Baath Party army officers seized power in the 1960s. Tishreen, an Arabic word for October, refers to the 1973 Arab-Israeli war, fought in that month, which saw Israel’s first military setback since the Jewish state came into existence in 1948. Al-Baath is the official mouthpiece of the ruling pan-Arab Baath party. All three are thin publications, reflecting a dearth of political, economic, and cultural life that observers blame on years of excessive state control. Only the weekly Al-Thawra al-Thaqafi goes some way to making up for this by reporting on the country’s literary culture. Press laws passed in 2001 confirmed the legality of publishing independent newspapers, but spelled out criminal libel regulations. The law says that Syrians can be granted a licence to issue a newspaper, magazine, or any other periodical publication. But the prime minister has the right to reject any application to “protect the public interest.” And the laws specifically ban the publication of information that might harm national security, the unity of society, the security of the army, Syria’s international relations, its dignity and prestige, national economy, or monetary security. Information about the army’s strength, weapons, and equipment, except those published officially, are also banned. The law imposes a penalty of three years imprisonment and a fine of up to 1 million Syrian pounds (US$21,500) for violations. Any publication deemed to be calling for a change in the country’s constitution in an unconstitutional way, or calling for acts of civil disobedience can be shut down. Those responsible for the publication are also punishable. Two independent papers have made waves since 2000, a satirical weekly called Al-Domari, edited by the well-known cartoonist Ali Farzat, and an economic weekly called Al-Iqtisadiya. Amid the initial euphoria about press reforms, some 100 requests were submitted to the information ministry for licences to set up new papers in 2001. A year later, Syria has only 15 new publications, most of them concerned with sports, lifestyle, entertainment, and classified ads. While progress in the sphere of political writing has come to a halt, businesses are taking advantage of the new openness. Two publications offering free advertising space, Al-Dalil and Al-Wasila, have taken the country by storm. Similar projects were launched in other Arab countries, including Jordan, Lebanon, Egypt, and Kuwait. When it first appeared, Al-Domari, with its biting satires ridiculing the government’s bewildering bureaucracy, empy promises, corruption, and even specific ministers, created a sensation among ordinary Syrians, who had never seen such material in print. A local journalist, who spoke on condition of anonymity, credits the publication for clearing the way for more open programming on the state television stations. But opinions differ as to how well Al-Domari has fared since its launch. “Al-Domari has lost its attraction. It’s more monotone, with less criticism of the government, though they have faced big pressures. Once the authorities even cut the electricity to their offices. Farzat is not as popular as he was before,” says one veteran media observer, who also requested anonymity, noting that Farzat is relying more and more on members of his family to run the operation. Others go further and describe him as “shoe-polisher” for the government. Despite the difficulties he has faced in recent months, Farzat was awarded a major accolade in December 2002 when the Dutch Prince Claus Awards Committee chose him as one of their nine winners of the year for “exceptional achievements in the field of culture and development,” a list that included Israeli journalist Amira Hass and Senegalese singer Youssou N’Dour. “Farzat utilizes all that he has to hand and takes it as far as possible to create a space for social comment and debate. His pointed caricatures, published in the domestic and foreign press, inspire his readers to reach sincere interpretations of their daily lives and to consider politics, economics, and society from new angles,” the committee said. Farzat says the difficulties the paper has faced since the beginning have become worse. “Our paper is going through difficult stages and our aim now is just to survive. Some people don't like this paper so they place obstacles in our path, both practical and psychological. This paper has no outside or internal funding except its sales. This is enough to show how popular the paper is,” he says, adding that the government has obliged the paper to use its official state distributor, limiting its reach, and has prevented state companies from advertising in the weekly. At the same time, the state Arab Advertising Institution takes 27 percent of the cost of any advert, while the distributors take 35 percent of the paper’s annual revenue. Perhaps most surprisingly, government-run television stations have also ventured into more independent coverage. During the holy month of Ramadan, when ratings shoot through the roof because families settle down in the front of the television at home after breaking their fast at sunset every day, saw a record 15 soap operas and satirical shows that tackled social and political issues with a new gusto, treating taboo issues and defending freedom of speech. The most talked-about by Syrians was “Spotlight,” a comedy series produced, directed, and acted by a group of young actors criticizing corruption, the role of intelligence services in clamping down on freedoms and, as the show put it, “how the sons of the officials and those close to the government are behaving.” There is no doubt that this sort of television was unheard of in Syria before Bashar took the reins. One episode featured a detained citizen who kept asking the authorities what the charges were against him. The officer investigating him finally revealed that “opposition” was suspected of being in his genes since his great-grandfather had been a known dissident, so a DNA check might be in order. Another episode discussed the widespread presence of intelligence informers in Syrian society. According to director Al-Laith Hajjo, a number of senior officials were annoyed by the series and some of them suffered heavy editing before being aired. “I heard that some people were not pleased because of a certain character or accent we used in the series,” he told Al-Domari on Dec. 9. Analysts reckon the authorities felt it was time to allow some criticism as a safety valve to help release some of the pressure created by the region’s worsening economic and political woes. One memorable sketch had Arab leaders arguing over whose national dish should be printed on a unified Arab currency although each suggestion was a variation on essentially the same thing. The soap opera, “Burying the Myth,” also dealt with the Arab-Israeli conflict, as did the Egyptian soap opera, “Knight without a Horse,” which the United States and Israel accused of being anti-Semitic but was popular on TV stations throughout the Arab world. State TV also took the chance to be first to report on the collapse of a dam in central Syria in June 2002 and to blame the negligence of local officials for the disaster, which killed 22 people, left thousands homeless, and flooded farmland in Syria and Turkey. Government officials like to say that this shows that the independent press is being trumped by the state media with its new open policy. “Syrian TV was first to broadcast the dam collapse and the corruption. So what can Al-Domari and others do,” one official asked rhetorically. His comments suggest that in Syria, as in Egypt, the authorities are being edged into the open by independent media because openness on the government’s terms is better than openness on the terms of independent journalists, over whom the state has less control. “ ‘Miraya’ and ‘Ray of Light’ on Syrian TV were very critical and a good indicator of the atmosphere here, [which allows anyone] to criticize any aspect of life in Syria. Now the public papers must do the same, on government, security, ministers. It was not possible to broadcast such programs before,” the official said. Radio is most likely to be the next medium to open up. Syria has licensed a number of Lebanese commercial radio stations to broadcast in Syria, but has yet to allow any new domestically produced stations on to the dial. The Lebanese stations are pop-rock-advertising channels and are advertised on billboards around the country. But the information ministry has recently set up a public youth station, as a prelude to finally allowing Syrians to set up private radio channels. In the current environment, there is little chance any new stations would feature anything other than music and entertainment, but the mere addition of new radio stations to the dial would still constitute another milestone in the slow process of freeing up Syrian media.